Southern Cross Soapworks: My Christmas soaping marathon! 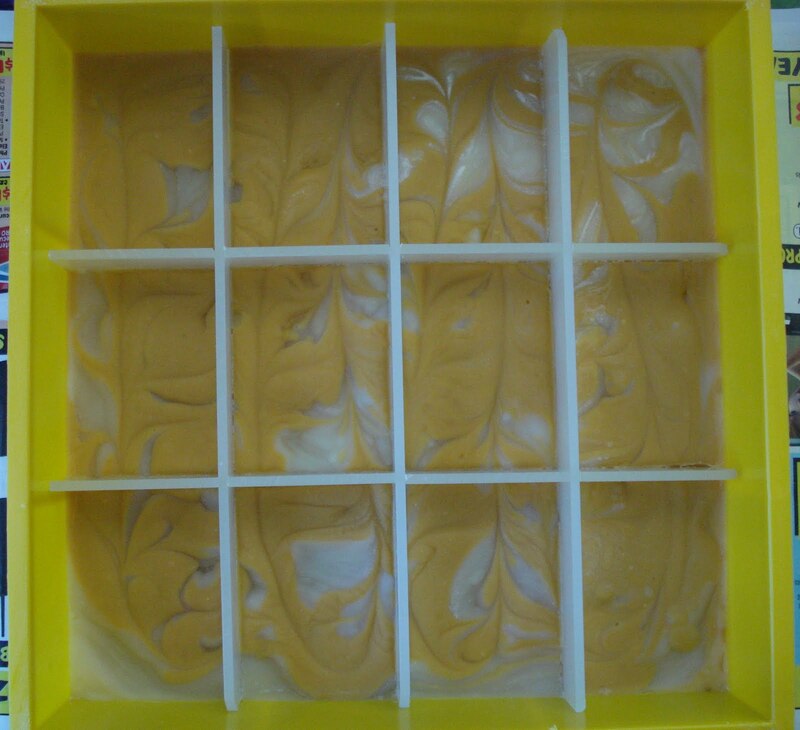 As I mentioned in my previous post, I made my very first CP soap over the Easter weekend in 2011 and then due to career-related events, I had a long break from experimenting with my new-found passion. So once I had time on my side again, and was considering what my future direction would be as far as my own business was concerned, I decided I would use Christmas as product testing time. What better way to kill two birds with one stone so to speak...make some soap so I could try out new techniques and fragrances and cover all the family Christmas pressies! Clever huh? My goal was to make about ten different CP soaps, eight common types and two specialities (two for the girls, and two for the boys). Until now, I'd only made three basic recipes which didn't involve any colouring techniques. This was my chance to get to know some fragrances and to try my hand at swirling. A little ambitious...I only had one loaf mould! I did actually get around to purchasing another mould - from Nizzy moulds - a wise investment! I got busy...making soap every other day. I had an absolute ball! Each day my husband would come home from work and be greeted by all these new and wonderful smells! Our house has never smelled so good! I can't believe how many beautiful fragrances are available - far too many to choose from! Being the procrastinating perfectionist I am, I did my research on colouring, especially swirling techniques, before I started...isn't YouTube fantastic?!! So began my marathon. I have to say, I'm really happy with the results. Check out some of my creations...not bad for a novice huh? 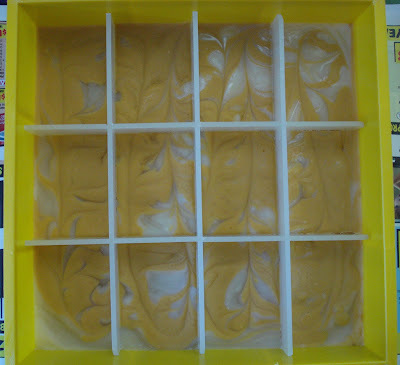 Sweet Meyer Lemon was the first ﻿of many soaps for the pamper pack. This was my first attempt at an in-the-mould swirl. The fragrance is certainly a sweet lemon. Feeling confident that I could manage this swirling thing, I moved on to attempt number two - Wasabi, with two gradients of green. I absolutely love this fragrance. It is really fresh! Once unmoulded, the scent drifted right through the house - it is a very strong fragrance. With Wasabi, I attempted an in-the-pot swirl. Not a great success as the majority of colour rested on the bottom of the pot and mould. I do love the textured top however! My technique for doing this was - 'get-it-in-the mould-as-fast-as possible' - as excessive stick blending, then taking my time to colour the separated batches, saw the mix come to trace really quickly - so I was in a panic to get it into the mould before it seized on me. Enthused by my first two efforts, I next tackled having a three-colour swirl - brown, black and white - with Drakkar as the fragrance. As this is a really musky scent based on a men's aftershave, I wanted some dark colours. This started as an in-the-pot swirl but once the mix was in the mould, I couldn't help myself and I just had to do some swirling with a chopstick. I was quite pleased with the outcome - there are some really subtle layers of colour throughout the body of each bar. Again, the top of the soap pleases me - I just love the various textures; they differ greatly from bar to bar. I have to wonder though, is there some evidence of soda ash on the top of some of these bars? I'm still not sure what soda ash looks like so I can't be sure. What do you think? This is one for the boys! A gorgeous fragrance, but I wonder how it will hold up when it is used. So what about one for the girls? Well, that was attempt four. I decided that I would base the speciality soaps on perfume-type scents so Ancient Sedonia was chosen for the first 'girly' soap. It is said to be similar to Calvin Klein's 'Obsession'. The idea behind this one was to have basically a reddish coloured bar with hints of pink and white swirls through the bar. Unfortunately, I discovered that the information I'd read on using red oxide in CP soap was right - it really does eat the colour. So what I ended up with was a pastel red with very subtle hints of pink and white swirls. I was initially really disappointed with this soap, however the more I looked at it, the more I came to like it. The pastel look really wasn't that bad and the fragrance is definitely 'girly'.